Are you ready to take your savvy shopping skills and turn it into a money generating business? Or, maybe you aren't even the best deal finder, but you've heard that people are buying out clearance aisles and cashing in using the Amazon FBA program? Either way…I am ready to show you exactly how you can start taking the sad items that end up on dusty clearance shelves and turn them into bright shiny products that the RIGHT buyers are searching for and are ready to pay premium prices for! Maybe none of your local neighbors are wanting to purchase that funky turtle shower curtain that Big Lots grabbed during a liquidation deal…But I bet there is someone across the states that has been looking for that exact piece to finish off her bathroom masterpiece. I mean, you've probably even found yourself in that scenario, right? Your favorite shampoo gets discontinued, so you pay a premium on Amazon? Or you can no longer find that game your son has been asking for, even though it was just on clearance! Now you have to head over to Amazon and pay full price for it! Trust me, I've been there, done that too…You are not alone. This is exactly what makes the Retail Arbitrage business model work so well with the Amazon FBA Program! You get to bring the products people are looking for to the Amazon marketplace and make a profit while doing so. And the best part: Amazon will do all of the packing and shipping for you! Secrets Revealed: Create a Full-Time Income From home and Let Amazon do ALL of the Fulfillment for You! Finally! You'll be able to build a full-time income buying products locally, and using the Amazon FBA system to do the grunt work. And I'll show how to do it step-by-step in my Amazon Boot Camp training course. It's no secret. Trying to build a full-time income with your Amazon Business is frustrating, confusing and extremely difficult. You are often met with headaches and closed doors at every turn. Finding solutions and answers seems next to impossible. Been stuck at the starting point. Completely lost and confused about exactly how to start. Felt overwhelmed by the onslaught of information which sends you in multiple directions. Been running in circles trying everything but getting zero results. Stalled with only a couple of sales which led you to think it's not worth it and you might as well give up. Don't QUIT!!! Don't toss away the easiest and most effective ways to make a full-time income from home! You Can Finally Create A Full-Time Income From Home and Let Amazon Do ALL Of The Fulfillment! You Can Do This! How do I know? Because I'm going to help you every step of the way!!! Nice to meet you 🙂 I'm Jessica and yes, I've been exactly where you are RIGHT NOW. Back in 2008 (you know that time when the economy basically collapsed? ), I had a job that I loved. I got to work with my hubby every day and even saw a lot of potential for growth in the company! I was working hard, and had a small side gig selling on eBay where I was bringing in some extra spending money (for things like Christmas gifts and my craft hobbies)…Mostly, it gave me an outlet to keep shopping bargains and couponing without becoming a hoarder. In the blink of an eye - everything changed! It wasn't any life altering medical issue or accident (Thank God), but that job I thought had a lot of potential was gone. Pulled right out from under me without any warning! Next thing I knew, we were short a couple of thousand dollars each month for our living expenses. The house we had purchased (right before that economic downfall we talked about before) - we now couldn't afford the payments. I had to do something, and I had to do something fast! 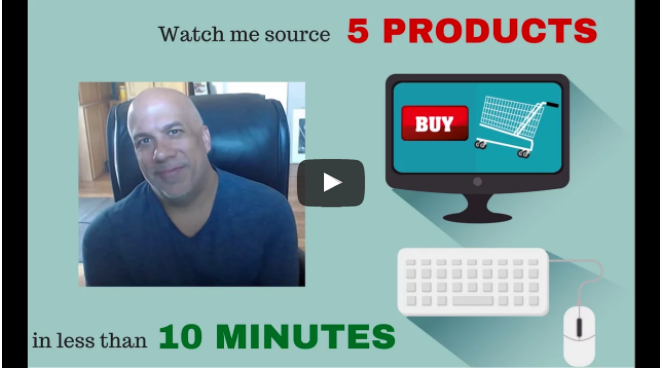 So I turned to the one thing I knew was working well…Selling online! I turned that eBay gig into an income replacement for myself…But I wanted more. I had the entrepreneurial bug and I was hooked! Like I said, eBay was a great side gig - but the constant holding of inventory and shipping sold orders was an organizational nightmare. Then I heard about people selling on Amazon. Selling and not having to ship all of their own orders.Not having a spare room stocked with inventory! With my eBay business, my growth was limited because, in order to make more, I had to sell more and to sell more I had to list more and the more that sold, the more I had to ship…and on and on the cycle went. Amazon took care of everything! They opened the door to the business growth I had been dreaming about! So I studied! I read book after book, spending hours and hours Googling questions and reading online forums. I learned how to take my eBay skills and build something even better…and BIGGER on Amazon. You see, at that time, courses teaching ‘retail arbitrage' were basically nonexistent and scanning apps for smartphones - forget it! Through a lot of trial and error, and a lot of late nights shipping packages full of sellable inventory to Amazon, I had a breakthrough! I'm finally able to work from home alongside my husband and our little boy, I can also have the freedom to choose my own hours, and I'm very lucky in that I can enjoy a full-time income, while Amazon does all the shipping and storing for me. With my breakthrough I was able to not only replace my previous income, but I was making enough to replace Cliff's income too! Then it hit me, if I could do this much on my own, what would happen if we were building our Amazon business together? So, Cliff quit his job in November of 2011 and our business exploded! That first full year, we were able to net over $100,000 in PROFIT. Talk about life changing. 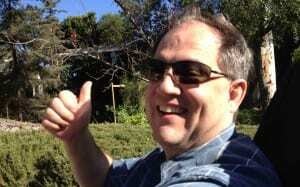 We had more than doubled our annual income, and we were working from HOME, part-time, TOGETHER! People around us started asking questions about how we were able to both work from home, part time and live a nice lifestyle. How did we find success? What was the magic formula?? After making so many calculated mistakes, I couldn't believe I had stumbled on the answer. However, I knew I wasn't alone. I knew others suffered from this exact problem. There was no doubt in my mind I had to share my secrets for success. After all, I wasn't anything special. I wasn't highly trained in sales or internet marketing. I simply had a stroke of luck. Wonderful - business building, breakthrough luck. Which is why I'm so excited you are here! I'm going to walk you (step by step) through EXACTLY how I was able to create a full-time income from home and let Amazon do ALL of the fulfillment! You will be ready to head to your local stores and start finding profitable inventory in no time. I'm not saying it's going to be easy…Because the truth is, it's gonna take some time to master Retail Arbitrage. But once you do, it will be so worth it! Imagine, being able to shop and essentially get paid for it…All the while getting to stay at home with your kids, or supplement your income without taking on another job outside of the home. 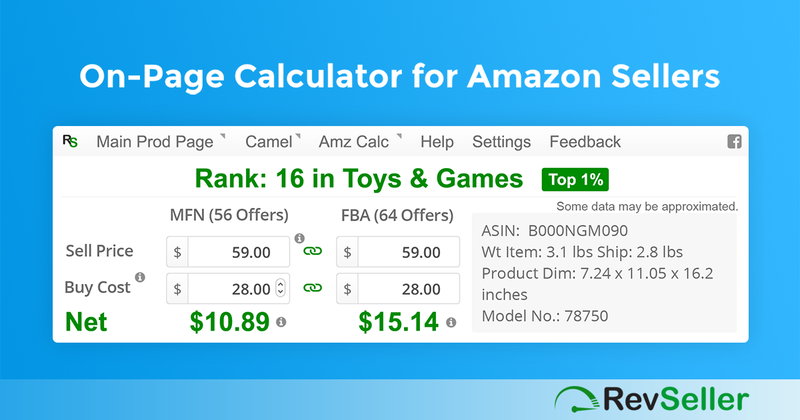 After working with more than 5,400 new Amazon FBA sellers to start their Amazon FBA businesses, we have figured out exactly where the pain points are and included them in our Amazon FBA selling course. Our modules are all very step-by-step and walk you through the entire process of starting your Amazon business. We are currently on the third version (3.0) of this Amazon course and our original members still have full access! Once you buy the Amazon Boot Camp, you never have to purchase it again. You get immediate access to any updates as soon as they come out! We know that we live in an on-the-go world. So we have created our videos to make sure they will play on (practically) any device at anytime. We use a paid hosting service that is constantly updating their systems to stay compatible with the latest devices. I record all of our trainings with high quality audio equipment so you can understand what is being taught at all times. We even have Closed Captioning (CC) on our videos so that you can watch what I'm saying if you can't play the audio or are hard of hearing. I am a fan of having checklists in front of me as I'm moving through a course and need to do steps in a specific order, so I've got some awesome printables for you! All of the sections that outline important steps you need to take, come with easy-to-check-off steps. Our private Facebook community is filled with super-supportive Amazon FBA sellers at all levels who are excited and willing to offer you support. With thousands of members, you can come in and know that you will get a quick answer to your question. You will never be made to feel like you asked a bad question or should just “figure it out!” We've all been in THOSE types of groups, and this my friend, is not that. Our group has amazing mentors who visit the group daily and there is rarely a question that goes unanswered. This Amazon FBA community is by far one of the most raved about features of our course. But just because this all worked for me, how do you know it will work for you? And I expected it, which is why I put this boot camp through the ringer. The Amazon Boot Camp is SO EASY to follow! 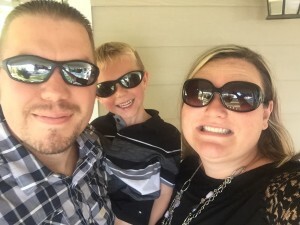 “The Selling Family’s Amazon Boot Camp was the first training I purchased, and it made starting our FBA business MUCH smoother than it would have been otherwise. I find Jessica’s teaching style very easy to follow. So then I bought the Back to School guide and learned a ton of information I never would have been aware of as a new seller. Then the Grocery Guide, then Liquidation Gold, then the Holiday Guide plus coaching, etc, etc. The GoDaddy Tutorial in particular is really valuable and easy to understand. John made his money back from the course in less than TWO WEEKS! 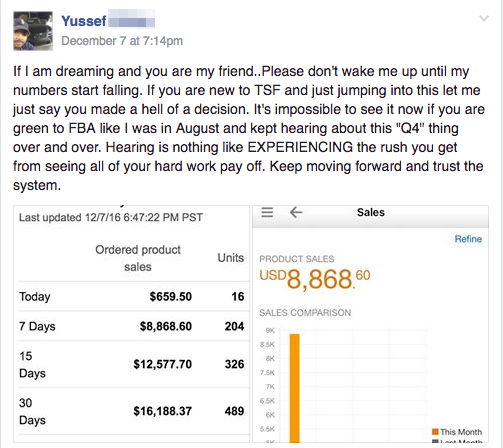 I started selling on FBA using the tutorials Amazon has. But it was hard for me to navigate through them all to find out what information was most pertinent to my new business. I decided to invest in the Amazon Boot Camp and immediately knew it was for me. From helping me set up the scanning app on my phone to having “assignments” that helped me understand sourcing. This class gave me the information that best helped me start out and increase my sales each month. The support in the Boot Camp Facebook Group alone has been worth every penny I invested in the whole course. My ROI for this class was about 2 weeks, so the value has more than paid for itself. 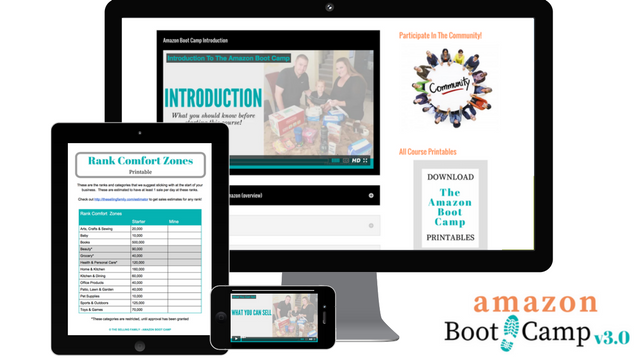 The Amazon Boot Camp helped fill in the gaps from doing it alone from the beginning! 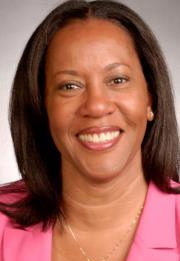 I can’t say enough about Jessica Larrew and the Amazon Boot Camp. It takes you step by step through the entire process of setting up and running your own Amazon business. 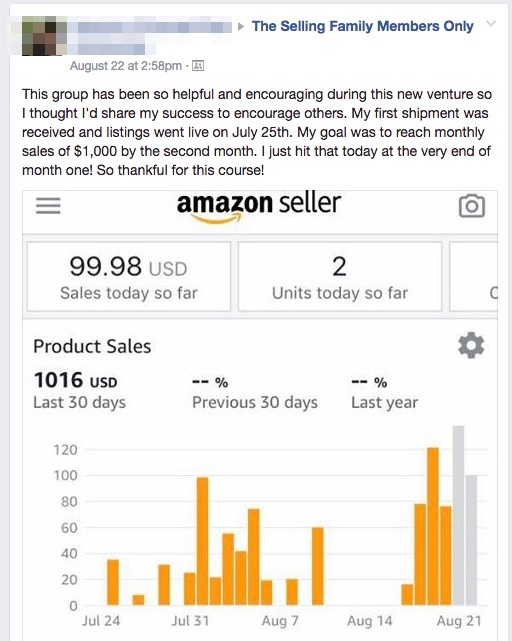 When I bought the course, I had already been selling Products on Amazon for more than a year. I decided to take this course because I still had so many unanswered questions and holes in my own knowledge about this business. The Amazon Boot Camp answered all of those questions and more. What I like most is that Jessica lays everything out in a logical, sequential, and organized manner. No stone is left unturned. She covers it all and makes it clear and easy to understand. 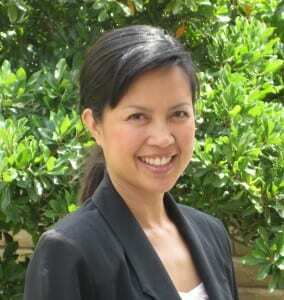 Jessica keeps adding new videos and training to the course materials to keep us updated. Jessica really cares about your success and is a fantastic mentor. The Amazon Boot Camp is well-worth your time and money. I highly recommend it! I know, I know! You may still have some questions and concerns about if this can really work for you right? I get it. And like I said before, it's not going to be EASY…But if you will put in the effort and follow the systems I have put into place for you it WILL WORK! Couldn't I just find all the answers I need on my own? Well sure! I mean, pretty much anything can be found on Google these days, right? But, my guess is you don't want to spend days and weeks sorting out information from a bunch of different sources that are all sending you in different directions! There are days I feel like I should just do things on my own, and then hours later I realize I could've just paid someone else and it would have been done in a snap! Should I really start with Retail Arbitrage? This is a biggie! There are a lot of different business models that people use when starting their Amazon FBA businesses. The most popular are: Retail Arbitrage, Private Label and buying Wholesale. I'll be honest, they all work! But, retail arbitrage by far has the lowest barrier to entry and is the easiest to learn out the gate. I recommend that you start with retail arbitrage (what I'm teaching in this course) and then after you've established your business and have been making money, consider adding in the other business models from there. How will I know exactly what to buy? Will I actually make money? I'll tell you straight up, I'm not going to tell you WHAT to buy! 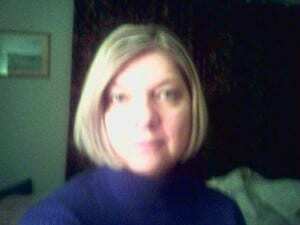 But, I am going to show you exactly how to find profitable items that will make you money. I'm a big believer in “teaching a man to fish”. After the training you receive in the Amazon Boot Camp, you will be ready to hit the stores running and start finding profitable products that you can resell on Amazon. How long is this going to take me? When will I start seeing sales? The Amazon Boot Camp course itself is go at your own pace and includes about 10 hours worth of training. 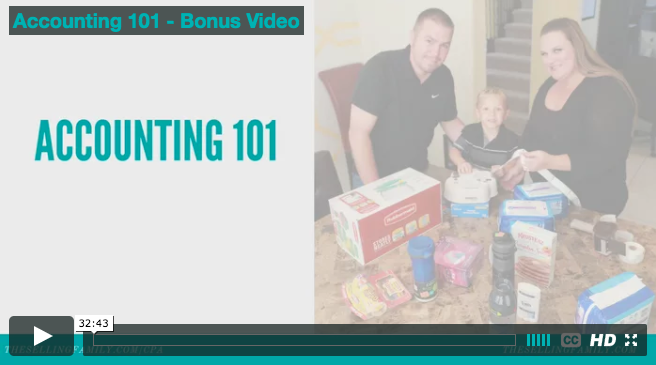 You can get started after watching about 3 hours of the training (the stuff you need to know before making a purchase) and the rest can be watched as you move along through the process of sending in inventory and running your business. How quickly you see sales will depend on how closely you follow our recommendations on rank and categories. Some of our students see sales in the first couple of weeks! These Members started seeing great results in the first months of selling on Amazon FBA and joining our Amazon Boot Camp! I want to be 100% sure you get an insane amount of value from this offer so I'm going to kick it up a notch. When You Sign Up Today, You'll Also Get FREE Access To..
RevSeller is one of my FAVORITE tools for Amazon FBA sellers and they have agreed to give our members a special coupon code to get a sweet discount on their first year of service (for new users only). This tool does on page calculations for profit margins on Amazon and you can one click to see if you are approved to sell the specific item. Jordan from Cleer Platinum has created a video showing us how this tool can help us find profitable products online that can be resold on Amazon.com. Using this method you can find products on line and have them shipped right to your door! 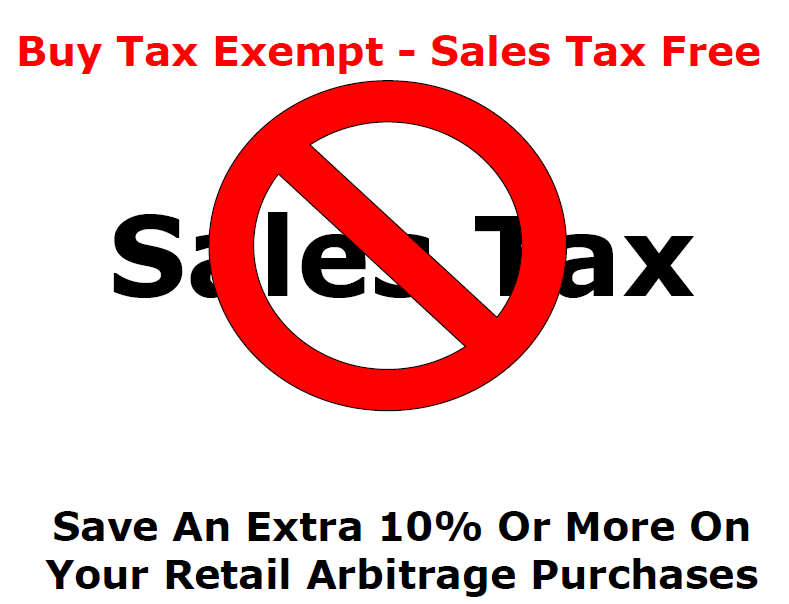 Along with setting up your sales tax, you can take advantage of buying inventory tax-free! Debra Conrad from Thrifting For Profit has given us this guide to our members FOR FREE. This guide shows you how you can use your tax-exempt certificate to save almost 10% right off the top of your purchase price! UPS allows us to get free labels that for our inbound shipments. 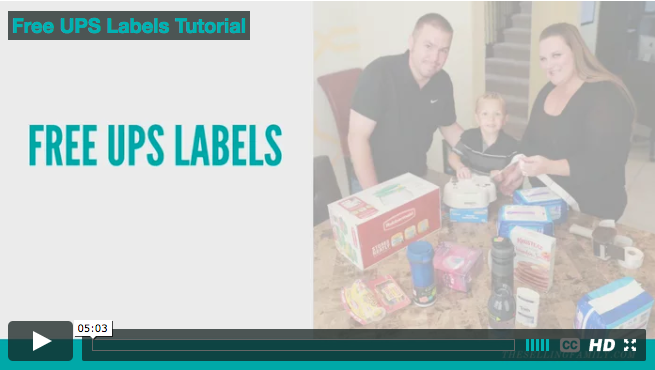 In this video I will walk you through the process of setting up your free account and then ordering labels that will be delivered to your door the next morning! Let's talk about one of those things that NO ONE wants to talk about! MONEY. Well, I guess we all like to talk about having and making money. But, most people don't like to take a deep look and make sure they are profitable in their businesses. I sat down with the CPA's from The Bottom Line Accounting and asked the questions that we all need to know about running a profitable (and legal) business. We talk about keeping your paperwork in order for the tax man. And we even go over the common missed tax deductions for Amazon business owners. You'll Get $300.00 Worth of Bonuses Completely FREE! You Can Try Out The Amazon Boot Camp Completely Risk-Free! I want to guarantee you take advantage of this offer today, and feel secure in your decision. You're protected by our 60-day money-back guarantee. If for any reason at all you're not completely satisfied, get in touch with our team and we will give you a complete refund. It's that simple. Before I let you go, I wanted to say a big thank you for reading this letter. I'm truly excited for you to get started with the Amazon Boot Camp and start seeing results in your new business. P.S. If you let this offer pass you by, I have one guarantee for you: nothing will change. At least not for awhile. But, grab the Amazon Boot Camp right now and you'll be on your way to finally building a full-time income with your new Amazon FBA Business. All you have to do is click the buy button above. 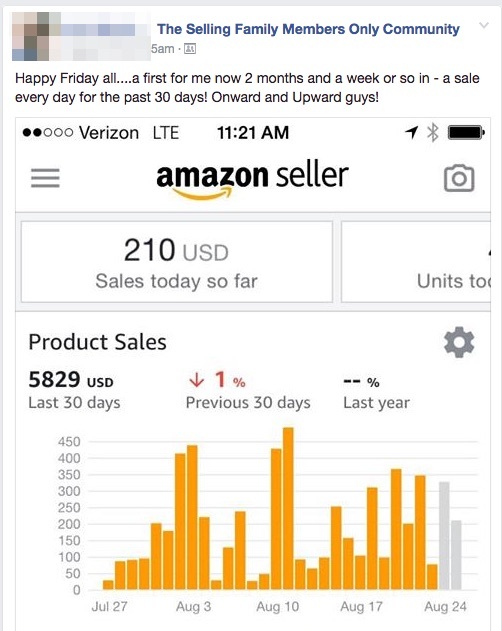 Selling on Amazon gave Eliza more time and money for her kids! Jessica’s Amazon Boot Camp was the answer to my prayers. 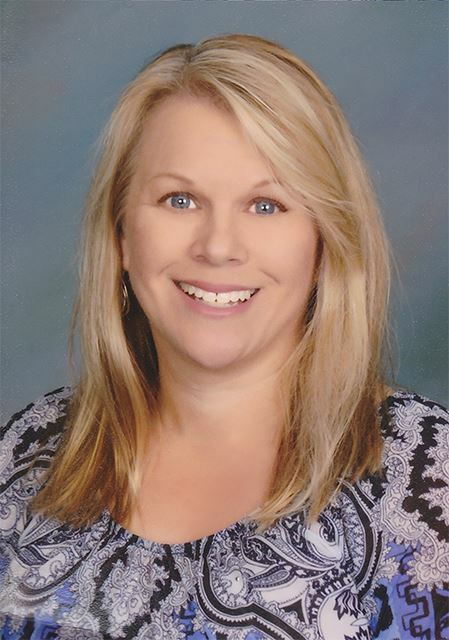 As a stay-at-home mom of two young kids, I was searching for a way to earn income while still being the primary caretaker of my boys. Jessica’s Boot Camp provided the means, but more importantly Jessica’s example as an entrepreneur showed me that I was not limited to working for somebody else. I am now loving my new Amazon business, making money, and STILL taking care of my kids. Thank you, Jessica!! The Amazon Boot Camp saved Greg THOUSANDS in potential mistakes! 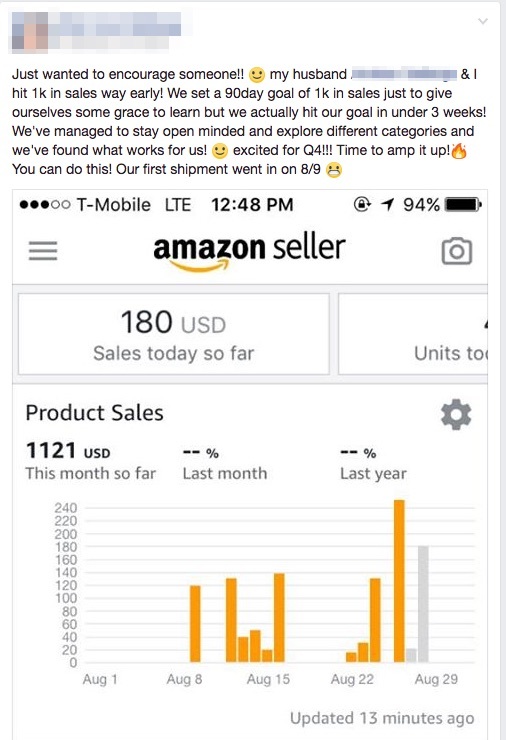 “A little over 2 years ago I was reading a blog post from the Penny Hoarder about selling on Amazon FBA and they spotlighted The Selling Family. It immediately intrigued me and I read as much of their free information as I could, then decided I wanted to give this a go. I jumped in and bought the Amazon Boot Camp and tried to absorb as much as I could. During that December I ended up with around $2800 in sales and was ecstatic… I remember my first payout was around $500 and was stunned at the potential this business model had. At the time our kids were 1 and 4 and the daycare bills alone were killing us. 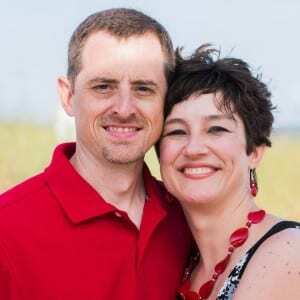 My wife and I work full time… I'm an engineer and run a small manufacturing company and my wife is a high school chorus teacher so she is often working late with lots of extra curricular activities. So I would source on the way home from work and eventually we started taking some road trips on the weekends. It didn't take long for me to realize just how much the Amazon Boot Camp helped me and how much money it saved me in the form of keeping me from making mistakes that I most assuredly would have made if I hadn't had it. I've since spent quite a bit of money on various training information and coaching groups they offer and every single dollar has been worth it. The support, information, genuine caring and the culture that they (Jessica & Cliff) have created with their Amazon Boot Camp and facebook community is amazing and as someone else recently posted, it's offering people a real chance doing something that is life changing. It only hit me last night that my profits from Amazon this year are going to exceed my salary from my full time job. It's good to know that if my job did go away, I'd be just fine. Thank you so much Jessica and Cliff (and everyone else in the group)… I would have never even started on this road without you. Tilata FINALLY saw results from an Online Course! I've invested in several online programs and The Amazon Boot Camp is the first and only course where I saw proven results in my first 30 days. Jessica's videos are step-by-step tutorials that are very easy to follow. If you are looking to get started selling on Amazon or need FBA advice to help build a solid Amazon business, I highly recommend the Amazon Boot Camp Program.